NationofChange.org is the original source of this post/images. Everyone who has kept abreast of national news has heard of the urban blight that has devastated Detroit. This once burgeoning center of the auto-trade in America is now a sprawling concrete wasteland – or is it? 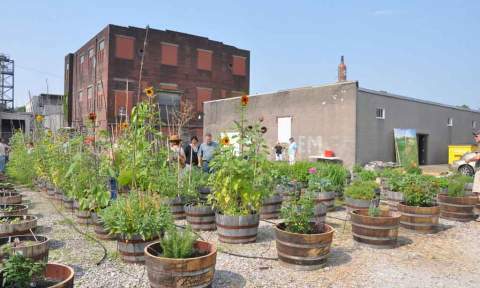 Food Field is an urban farm in the middle of central Detroit. It grows heaping amounts of organic produce using permaculture. They even raise chickens and ducks, grow food utilizing aquaculture, raise honey bees, and have their own organic fruit orchard. This all happens on a piece of land that is smaller than that of many McMansions. Even in one of this country’s most economically depressed cities, where unemployment rates are currently swollen to 14-17 percent, people are flourishing growing their own organic food. The city of Bryan works with the initiative to grant vacant or unused plots around downtown to be used to grow organic gardens. They also plan to provide some of the produce grown to local restaurants to make dining out healthier too. If you think an urban garden is relegated to just growing vegetables and herbs, think again. People are successfully raising chickens in chicken coops in urban and suburban areas all over the country – and aside from providing nutrient-dense eggs, with sun-yellow yolks like you’ve never seen in a grocery store, these birds also create great compost to amend organic garden soil. It seems we can do a lot with a little ingenuity. One supermarket in Brooklyn, New York has decided to get in on the action, and now has an entirely organic rooftop garden. It was constructed via a partnership with Gotham Greens, a Greenpoint-based rooftop farm, and you can’t get more local than five miles from your borough! They produce tons of organic produce all year long and don’t use a single pesticide. I’m sure this miffs Monsanto, Bayer, and Syngenta signifcantly, but you can’t stop Americans who know the truth about GMOs and pesticides. It isn’t just in the US, though, that people are taking sustainable agriculture into their own hands. Sky Greens in Singapore is the, “World’s first low carbon hydraulic water-driven, tropical vegetable urban vertical farm, using green urban solutions to achieve enhanced green sustainable production of safe, fresh and delicious vegetables, using minimal land, water and energy resources.” Singapore faces the dismal fact that Locally grown vegetables currently only constitute 7% of Singapore’s consumption. With creative farming initiatives like the ones Sky Greens offers, fewer fruits and vegetables would need to be imported, and people could enjoy more locally sourced food that isn’t controlled by biotech monopolies. According to these innovative farmers, “the production yield of Sky Greens Farm is 5 to 10 times more per unit area compared to other traditional farms growing leafy vegetables using conventional methods in Singapore.” They also offer year-round production and are not subject to climate events like drought or tsunamis. Finally, an organization in New Zealand, Canada and the US offers a supremely novel idea for helping people grow food who simply don’t have the land to grow it on. They are called Sharing Backyards. Taking advantage of the fact that many urban and suburban areas have lawns, yards, and empty spaces which people aren’t utilizing to grow food, but could be, individuals can logon to their site and either put in a request for space to garden, or offer land that currently sits idle. Not only does this idea help people who are often the most marginalized have better access to healthy food, but it teaches us to rely on each other instead of huge corporate conglomerates that don’t care about feeding the world, only poisoning the planet for profit. If you have a creative idea about taking the food supply and redirecting it in a more sustainable direction, please share it with us at Nation of Change.